This dress has a dramatic high low cut and awesome details, including the contrast lace waistband. The Maricela Shimmer Contrast High Low Dress is fully lined to the mid-thigh, except at the waistband, which is semi-sheer. It is made of a silky fabric with a bit of shimmer to it. This dress features a V neckline, a wide waistband, and a high low cut. The straps and waistband of this dress are made of a contrasting black fabric and the waistband has vertical stripes of semi-sheer black lace. Fabric ruching at the back of this dress expands to fit your shape and completes this pretty dress. The Maricela Shimmer Contrast High Low Dress would look nice paired with black pumps or strappy heels for any semi-formal event. Details: Fully lined to mid-thigh; waistband is semi-sheer. 100% polyester. Hand wash in cold water. Do not bleach. Line dry. Small measurements: Length from top of shoulder to hemline: 33-49”. Bust: 30”. You have added Maricela Shimmer Contrast High Low Dress in Magenta into Wishlist. You have added Maricela Shimmer Contrast High Low Dress in Magenta for Stock Notification. You have set Maricela Shimmer Contrast High Low Dress in Magenta as a loved product. 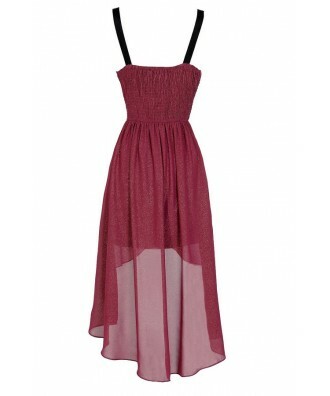 You have removed Maricela Shimmer Contrast High Low Dress in Magenta as a loved product.